Hypertensive lower esophageal sphincter (HLES) is a rare esophageal motility disorder characterized by elevated resting lower esophageal sphincter (LES) pressures with normal LES relaxation upon swallowing and is described as a distinct disease entity from achalasia, a motility disorder characterized by a loss of the peristaltic waveform in the esophageal body and a failure of the LES to relax upon swallowing. Operative myotomy is a known effective treatment for achalasia, and although not clearly defined, successful treatment of hypertensive LES with operative myotomy has been reported. 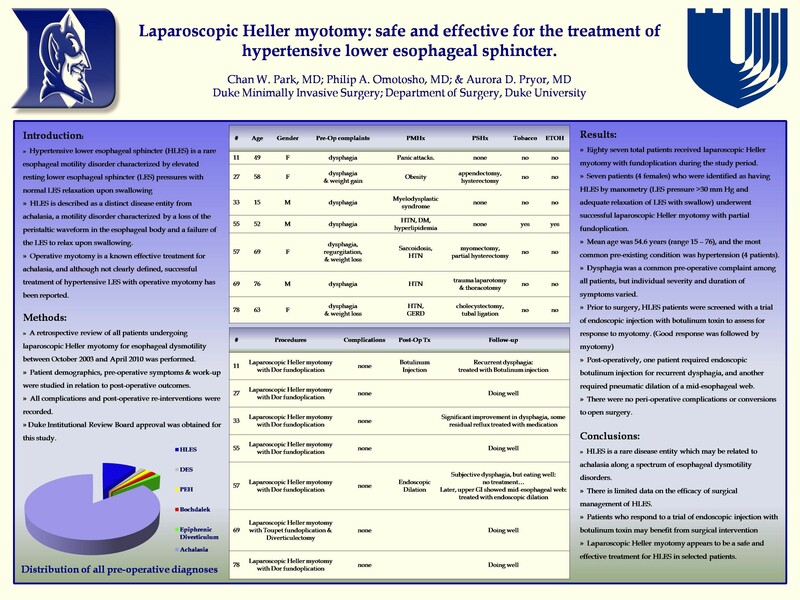 A retrospective review of all patients undergoing laparoscopic Heller myotomy for esophageal dysmotility between October, 2003 and April, 2010 was performed to identify patients with HLES. Patient demographics, pre-operative symptoms, all pre-operative work-up and treatments were studied in relation to post-operative outcomes. All complications and post-operative re-interventions were recorded. Seven patients (4 females) who were identified as having HLES by manometry (LES pressure >30 mm Hg and adequate relaxation of LES with swallow) underwent successful laparoscopic Heller myotomy with partial fundoplication. Mean age was 54.6 years (range 15 – 76), and the most common pre-existing condition was hypertension (4 patients). Dysphagia was a common pre-operative complaint among all patients, but individual severity and duration of symptoms varied. Prior to surgery, patients were screened with a trial of endoscopic injection with botulinum toxin to assess for response to myotomy. Post-operatively, one patient required endoscopic botulinum toxin injection for recurrent dysphagia, and another required pneumatic dilation of a mid-esophageal web. There were no peri-operative complications or conversions to open surgery. HLES is rare disease entity which may be related to achalasia along a spectrum of esophageal dysmotility disorders, and there is limited data on the efficacy of surgical management of HLES. Patients who respond to a trial of endoscopic injection with botulinum toxin may benefit from surgical intervention, and laparoscopic Heller myotomy appears to be a safe and effective treatment for HLES.